You know what they say: great things come in small packages. And, oh, is this the case when it comes to seeds. These little guys are chock-full of nutritional goodness, and are quite scrumptious to boot. 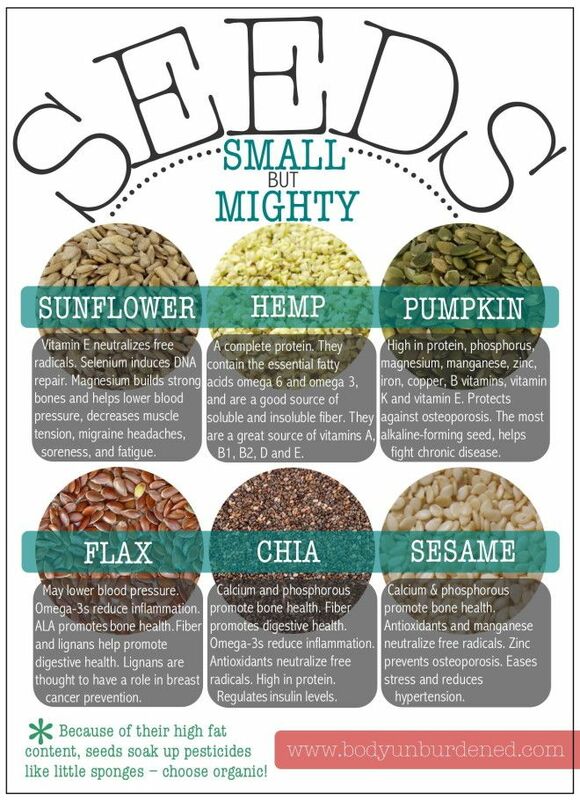 Hemp seeds are a complete protein—meaning they provide all 9 essential amino acids. They contain the essential fatty acids omega 6 and omega 3, and are a good source of soluble and insoluble fiber. They are a great source of vitamins A, B1, B2, D and E. Vitamins A and E help promote a healthy complexion. Vitamin A has also been shown to inhibit the production of DNA in cancerous cells. B vitamins help the body metabolize fats and protein; promote healthy skin, hair, eyes, and liver; help the nervous system function properly; and are necessary for proper brain function. Vitamin D helps regulate calcium and phosphorus in the body, and also plays an important role in maintaining proper bone structure. 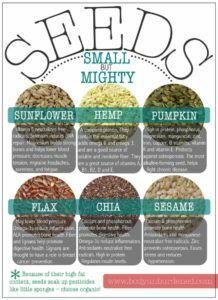 I prefer hemp hearts (shelled hemp seeds), which have a really subtle flavor and are very soft. They’re very tiny, so aren’t necessarily convenient for snacking in terms of grabbing a handful. But they make for a wonderful addition to smoothies, salads, and yogurt. Ch-ch-ch-chia! This little seed has really become popular in recent years, and for good reason! A single serving of chia has 18% of the recommended daily intake (RDI) for calcium and 27% of your daily RDI for phosphorus, which promote bone health. A single serving also has a whopping 33% of your RDI for fiber, which promotes healthy digestion. Furthermore, chia are packed with omega-3 fatty acids, with nearly five grams in a one-ounce serving. These little seeds are packed with essential minerals such as manganese, copper, iron, phosphorus, zinc and calcium. Manganese, phosphorous and calcium help promote bone health. Iron in necessary for the production of red blood cells and to carry oxygen through the bloodstream. Zinc promotes bone health and prevents osteoporosis. Sesame seed oil reduces hypertension and eases stress. Antioxidants fight free radicals, promoting youthfulness and strengthening the immune system. Just a quarter cup of sunflower seeds provides you with over ninety percent of your RDI for vitamin E, the body’s primary fat-soluble antioxidant. Vitamin E neutralizes free radicals and has significant anti-inflammatory effects. Sunflower seeds are also a good source of selenium, which has been shown to induce DNA repair and synthesis in damaged cells, to inhibit the proliferation of cancer cells, and to induce their apoptosis, the self-destruction mechanism the body naturally produces to eliminate worn out or abnormal cells. Sunflower seeds are also rich in magnesium, which is necessary for strong bones and helps lower blood pressure, decreases muscle tension, migraine headaches, soreness, and fatigue. Pumpkin seeds are a fantastic source of protein, phosphorus, magnesium, manganese, zinc, iron, copper, B vitamins, vitamin K and vitamin E. They also contain L-tryptophan, which promotes healthy sleeping patterns and lowers depression. High zinc levels make them a natural protector against osteoporosis. They are also the most alkaline-forming seed. According to studies, pumpkin seeds prevent calcium oxalate kidney stone formation, and significantly reduce inflammation. These dark brown seeds are excellent sources of omega-3s. Just one tablespoon of flaxseed surpasses the RDI of omega-3s, which help reduce the inflammation that leads to conditions such as asthma, rheumatoid arthritis, migraine headaches, and osteoporosis. Alpha-linolenic acid (ALA) is a kind of omega-3 that is found in flaxseeds that helps promote bone health. Flaxseed may lower blood pressure. They are also a great source of fiber: with one tablespoon containing three grams of fiber. This high fiber content helps promote digestive health. Lignans in flax also promote regular digestion, and are thought to have a role in breast cancer prevention. There are so many great ways to enjoy seeds. Sunflower and pumpkin make a great snack on their own, while chia, hemp, sesame and flax make great a great addition to any meal – sprinkled on salads, in sauces, and more! Remember, try to choose organic – because of their high fat content, seeds soak up pesticides like little sponges!